I'm offering a stunner of a copy which is every bit as nice in terms of the way it presents, centering, page and production quality. 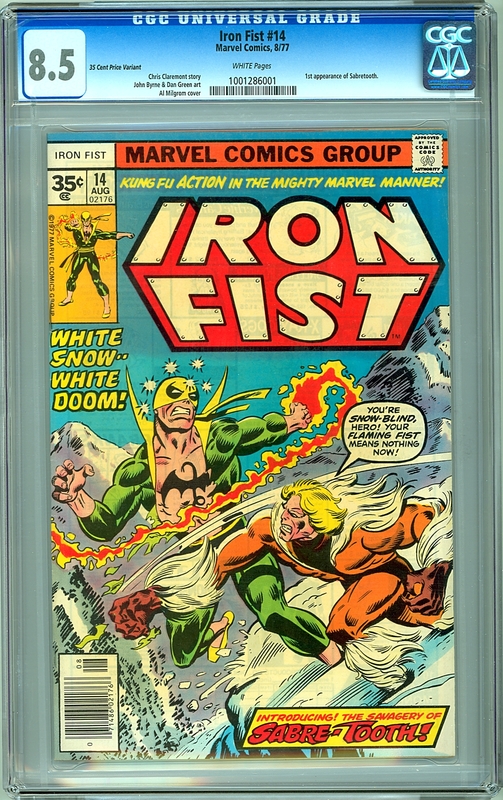 The CGC census shows 25 total copies of the 35 cent price variant (compared to 1593 of the regular edition) graded to date. Only six copies grade higher than this 8.5. The purpose of the "test" variant versions was to test market-resistance to the increase. 35¢ "test" variants are much rarer than their 30¢ counterpart. Iron Fist 14 is one of the rarest and most sought after of the 35¢ price variants. It has continued to enjoy a steady value climb (with the 9.2 price increasing $400 in the [40th] most recent edition of the Overstreet Price Guide). This product was added to our catalog on Friday 29 October, 2010.